Text: I went to a film festival of old moving pictures at Hosei University on Sunday, May 10, the day of the Imperial Silver Wedding Anniversary Celebration. The windows in the lecture hall were covered with black cloth, throwing the room into darkness. Thin shafts of afternoon light snuck in with an eerie blue glow. Random, confusing landscapes and faces flashed before me. The shootouts from the Ministry of War advanced with an exciting and relentless pace. Thick smoke enveloped the picture, obscuring clarity. I thought I could see the screen growing brighter through the dissipating smoke, but the images disappeared and the lecture hall suddenly lit up. American comedies and newsreels alternately lit up the screen, and next up was the surrender of Port Arthur. An officer from the Ministry of War got up to introduce the feature. The film was originally shot by a German military observer and had only recently come into the hands of the Japanese Ministry. There were scenes not only of the famous meeting at the naval base of General Nogi and General Stessel, but also of the bombing of the fort at Niryuzan. A cinematic treasure, the officer explained, then he disappeared into blackness as the room went dark. But before his khaki-uniformed image faded from my eye, another was projected in its place – a soldier leading a parade of men headed for the front. Troops marched through Yokohama’s Isezakicho behind their bearded platoon leader. The dress braids of his uniform stretched like ribs across his chest, and he swaggered with his sword held high. The soldiers wore solemn expressions. That scene alone was enough to remind me of a twenty-year old military tune I’d long since forgotten. I couldn’t understand why I was so moved by the bluish images of the mountains surrounding Port Arthur, but it was like seeing my own memories up on the screen. What a terribly somber mountain it was. A dim glow emanated from behind the hills, but the sky blanketing the peaks was devoid of light. I knew that the port lay under the darkest spot in the sky. Soldiers hauled a cannon up the mountainside. The outline of the group blurred as they panted up the dark path. An older enlisted man, standing to the side, waved his hands back and forth, calling out orders. He howled like a beast. I turned to the person next to me. “Poor bastards,” I said. Heads hanging, eyes fixed on the dark landscape, they advanced slowly against the weight of the heavy rope. The headless soldiers moved as an undifferentiated mass. Then one unexpectedly lifted his face. The sky was as black as the road. Cutting through the darkness like a dog with its head hung low. I saw a towering peak jut up before us as I too climbed the mountain. “What mountain is that?” I asked. “Beats me,” answered a nearby student. Cannons shot into the mountainside. In a hollow under the cliff, a group of five or six soldiers furiously fired and reloaded artillery, the machinery rolling back and forth with the force of the recoil. White smoke rose and soon disappeared from the mouth of the cannon. The sound, too, was sucked into the belly of the dark mountain, the echo dying there as well. I felt uneasy not knowing where the shells were landing. Yet there was no choice but to fire. Not firing I would be more terrifying. Facing each other across the dark mountain, both sides let loose a deafening barrage of firepower day and night. The fighting changed the shape of the mountain itself. Those soldiers in the hollow acted out of fear. When smoke cleared from the cannon, I grew nervous. If only they’d fire again. Who cares where it landed! An ominous cloud of smoke rose from a distant ridge. Tens, maybe hundreds of sparkling objects formed lines in the smoke. This was soon followed by another dark cloud. My eyes welled with tears when I learned this was the bombing of the mountain fort of Niruyzan. I cried for the men on both sides. Next came the long-awaited encounter at the naval base. Amidst the bleak scenery I could make out the faint image of a cottage with stone walls. From off in the distance indistinguishable figures on horseback grew in size as they approached, but the blurry image never came into focus. It just faded away. A formation of Russian soldiers on horseback rode unsteadily past a row of storehouses. The ceremony at the base was over. Nogi’s and Stessel’s expressionless faces passed quickly before my eyes like a bank of fog. The title of the film, The Long-Fought 200-Day Battle, faded from the screen. Troops with neither packs nor guns marched by wearing long overcoats with sleeves hanging down over their hands. Houses lined the roadside, but it was hard to get any perspective on them – how far away they were, whether they had windows or roofs. There was something eerie about these lifeless men. Weren’t they in fact the war dead risen from their graves on the shadowy mountain for one final march? No one averted his gaze. They marched with their eyes on the men in front of them. “The Triumphant March into Port Arthur!” boomed the voice of the officer on the stage. 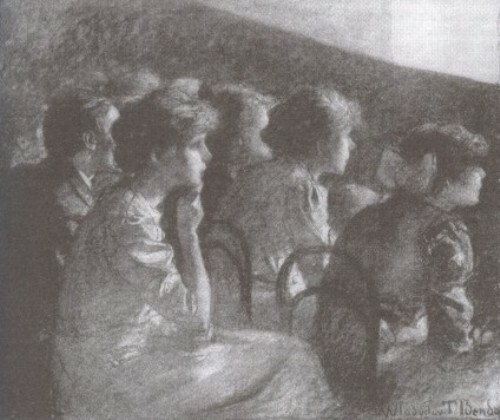 The audience, crammed into that dark room, broke out in loud applause. Tears streamed down my face. The row of soldiers marched on and on. My eyes clouded with tears, obscuring the people in front of me. I lost my bearings and was set adrift in an unfamiliar place. “Quit crying,” said a man walking next to me. Someone behind us was weeping. The crowd kept clapping. My cheeks wet from crying, I fell into formation and was led out into the quiet of the city streets, out into nowhere. Comments: Hyakken Uchida (1889-1971) was a Japanese novelist, short story writer and academic. He taught at Hosei University, which is in Tokyo. The films he describes seeing were of the Russo-Japanese War of 1904-5, which included the siege of Port Arthur, a Russian naval base in Manchuria, which ended in its capture by the Japanese forces. The Long-Fought 200-Day Battle, if such a film actually existed (the passage is meant to be a work of fiction), would have been a compilation of archive film of the war. The silver wedding anniversary of Emperor Taishō and Empress Teimei was in 1925. My thanks to Dawid Glownia from bringing this text to my attention. This entry was posted in 1920s, Fiction, Japan and tagged Applause, Audiences, Comedies, Crying, Dark, Festivals, Hyakken Uchida, Japanese, Lecturers and introductions, Newsreels, Tokyo, Universities, War films. Bookmark the permalink.